Holiday volunteer initiatives are occurring across the 14-office MSLGroup North America network. Holiday volunteer initiatives are occurring across the 14-office MSLGroup North America network. In New York, many of these are an extension of the MSLGroup CARES (Colleague's Action Relief Effort and Support) rapid response volunteer and activation effort put in place after Hurricane Sandy had a serious impact on the New York and New Jersey communities where many of our employees live. As part of the response to the storm, MSLGROUP North America raised limits on paid volunteer days across all its offices. MSLGroup CARES teams from MSL New York are volunteering with Camp TLC (Together Living a Challenge) each weekend in December on Staten Island to give children impacted by the storm a joyful holiday season. On Saturday, December 1, our employees helped facilitate an arts and activities day camp for children displaced from Hurricane Sandy and living with their families at Mount Manresa, a Jesuit Retreat Center. MSLGroup CARES also sent volunteers and supplies to hard-hit Red Bank, New Jersey, partnered with Fratelli Pizzeria and Bakery to donate over 50 pizzas to Staten Island families in need, and collected 310 pounds of food for City Harvest in a Thanksgiving food drive. MSL New York also has collected more than 70 coats so far for the New York Coat Drive and is beginning its Toys for Tots drive. Community Connected, part of MSL New York's Gen-Y leadership program Generation Activation, is raising money with charity: water, a global organization that brings clean, safe drinking water to people in developing nations. Schwartz MSL Boston is currently holding its 13th Annual Toys for Tots drive. The U.S. Marine Corps Reserve Toys for Tots Program collects new, unwrapped toys during October, November, and December each year, and distributes those toys as Christmas gifts to less fortunate children in the community. The entire MSL Atlanta office is delivering meals with Project Open Hand on December 7. Open Hand makes and delivers meals to people who cannot leave their houses, whether they are elderly or disabled. 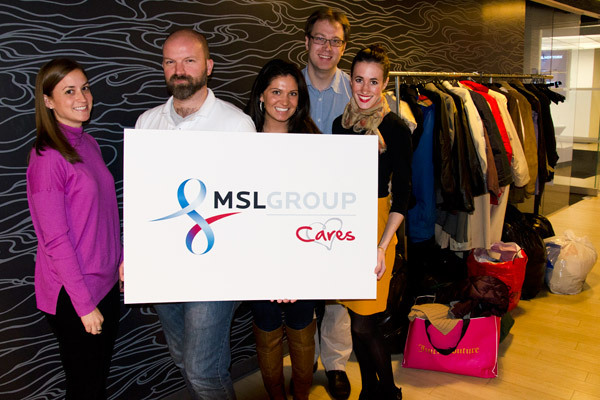 MSL Washington DC is having a “Casual for a Cause” week; for every day staff wears casual clothes from December 17-21, they will contribute $5 to a collection that will be donated to the DC Central Kitchen. Schwartz MSL San Francisco will provide 25 gift bags to children in homeless shelters throughout San Francisco with Project Night Night. Through the Raphael House, the office is sponsoring a family with gifts for each of two children, a family gift and a Safeway gift card. MSL Los Angeles continues its support of Adopt-A-Family, a Los Angeles giving program administered by the Los Angeles Cathedral, and is collecting items this year for the Meza family.